IoT data streams, big data and advanced analytics collide to create new challenges. In most ways, Internet of Things (IoT) analytics are like any other analytics. IoT analytics use most of the same algorithms and tools as other kinds of business intelligence (BI) and advanced analytics. Even so, the IoT is creating unparalleled information management and analytics challenges. 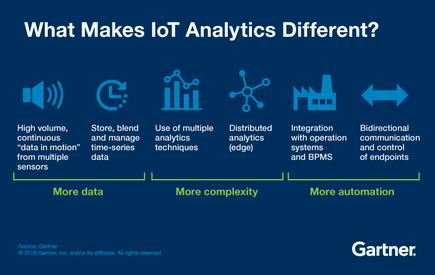 During the Gartner Business Intelligence & Analytics Summit this week in Grapevine, Texas, Jim Hare, research director at Gartner, examined the difference between IoT analytics and traditional analytics. What Makes IoT Analytics Different? By 2020, Gartner predicts that more than half of major new business processes and systems will incorporate some element of the IoT. Analytics are essential to the success of IoT systems. They are arguably the main point of the IoT as they support the decision-making process in operations that are created in business transformation and digital business programs. Analytics are typically used for reporting, diagnostics, prediction and other cases of advanced analytics, but the IoT is requiring the combination of all of these types of analytics, including streaming data, to analyse and filter the fast-moving data. “Just as we’re seeing a lot more complexity in the data, we’re seeing more complexity in how to manage that data,” Hare says. Managing and storing this data in an efficient and timely manner sometimes requires event stream processing platforms, time series database management systems and specialised analytical algorithms. However, many BI and analytics practitioners lack expertise in the streaming analytics, time series data management and other technologies used in IoT analytics. With all of the data coming from sensors, there will be a need for multiple analytics techniques. Some IoT analytics applications need to be distributed, so that processing can take place in devices, control systems, servers or smart routers at the sites where sensor data is generated - this makes the analytics harder to deploy, manage and maintain. With IoT analytics, much of it will be automated. Humans will be the exception and only involved when something goes awry. Integration with operational systems and business process management systems will become the norm. An IoT solution is only as strong as its weakest link in the overall solution. There are many disparate parts to an IoT solution that must be integrated together. While IoT automates business processes, end-to-end security and identity management can reduce the risk of an automated solution that controls vital operations.